My question seems to be on the HNQ. Now I have seen many HNQs and I guess it may be due to the title. However, I do not want it on the HNQ list as it attracts traffic from other sites and they may upvote answers that are easier to understand, instead of those that are better. 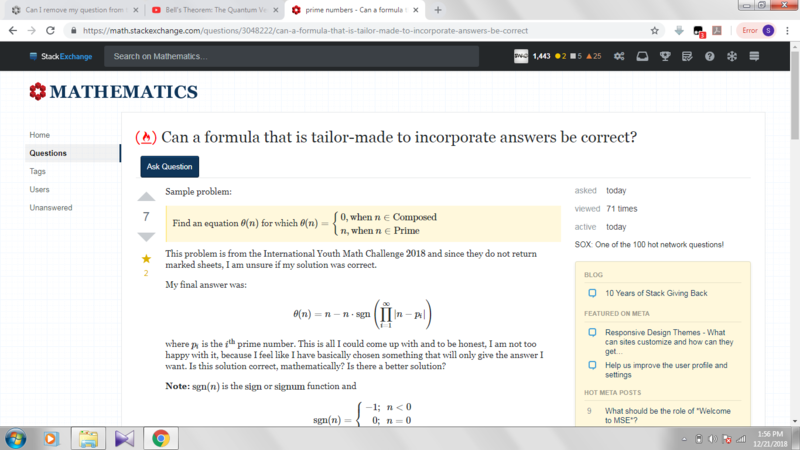 Ofcourse, considering it is on math.se, it won't be on the HNQ list for long but can I, as the person who formulated the question, remove it from the HNQ list? Having a question in the HNQ is not necessarily a bad thing for you. This brings more attention to your question and bigger probability of getting an answer. Also a separate issue is whether the decision on removal of the question from the HNQ list should be mainly by the OP or more by the community - if the question is good representative of the site, it's better for the community if it stays there. Here is a related feature request on Meta Stack Exchange about possibility of removal of a question from the HNQ: Allow mods or gold tag badge holders to prevent question from being on hot network questions list. I will add that personally I would prefer user to choose what is better title. My personal opinion is that the decision whether or not to include some formula into the title should ideally be based on whether it improves the title. The concern whether the question might get into HNQ should be secondary. I will also add link to the section about titles of the FAQ item How to ask a good question. Not the answer you're looking for? Browse other questions tagged discussion support hot-questions-list . what are signatures of good questions on math.SE and how can they be quantified?